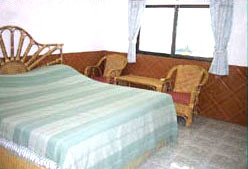 Phi Phi Don Chukit Resort has accomodation for deluxe air-conditioned suites with satelite TV, refrigerator & mini bars, to smaller simple, clean and fan bungalows. 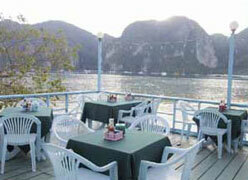 The resort's ambience is further enhanced by a natural landscape and stunning views of the Phi Phi Tonsai Cliffs and Harbour.The beach front restaurant Phi Phi Don Chukit Restaurant provides guest with the best superb Thai seafood and western favourites right on the point. 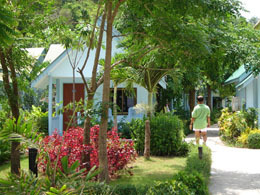 The Views of the bay and sun down are exquisite.Located on the beach, in quiet landscaped surroundings but just a 6 minutes stroll from the ferry pier in Tonsai Village Phi Phi Don. This is the same Phi Phi Village pier of arrival and marks the start of Phi Phi Don Village and bazaar, through which you can explore this fascinating island people. 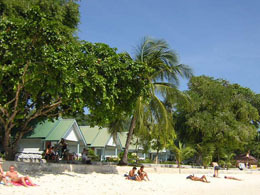 Our beach front restaurant provides our guest with the best selection of Thai, Western and seafood cuisines. 2. Kayaking Tour Of Phi Phi island. With a large selection of rooms to choose from, whether you require an Air-conditioned room, TV, or a specific bed arrangement, there's something for everyone. 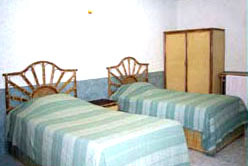 Air-conditioning - Double Bed (1 bed sleeps 2 people) - Hot Water Shower - TV UBC (Satellite TV) - Mini Bar. 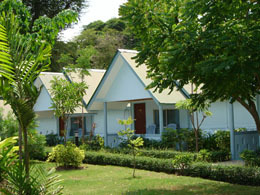 The bungalows occupy the first and second row from the beachfront.